1. What is your monthly net income? Take a look at your paycheck stub. Write down the amount you bring home. Take into account if you have an irregular income, get paid monthly, bi-monthly, or weekly. Add accordingly. Now add in any other income you might receive. There. That’s the number you have to work with. This is also where your small dose of reality can be used. 2. 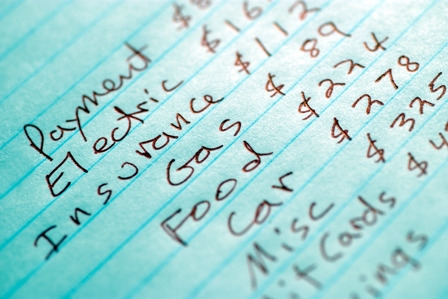 What will your monthly expenses be? Now estimate about how much you think you currently pay each month or how much you will be paying and write the amount next to each item. Be honest. Some items you will probably have no idea, since this is your first apartment experience. Like rent. As a general rule no more than a third of your income should be spent on rent. You can also ask friends or family how much they pay for things like utilities, and get a ballpark estimate. Add up the expenses. If they are more than your income, move on to the next step. 3. What can you live without? That last point could help you out a lot because a roommate will help you cut your monthly costs. Learn more about the qualities you should look for in a roommate and the pros and cons of having a roommate. Here’s your last step. Now that you’ve figured out approximately what you can afford each month, write the number you’re willing to pay for rent for your first apartment in big numbers and circle it. Then draw a smiley face. Congratulations! You’re ready to start searching for apartments in Chico or Redding!